Sometimes you’re vehicle might show as stationary even though you know that you’re vehicle is actually moving. This could be one of three potential issues. Checking which of these is the likely reason for your issue is easy. Simply click on the radar screen when logged into your account and click on your vehicle. 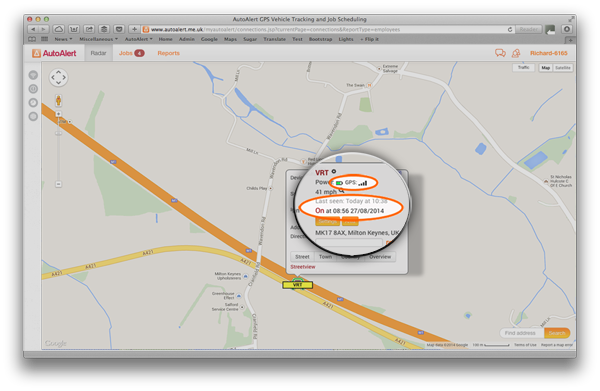 The pop up will show the status of the GPS, the time the GPS unit was last seen and whether the ignition is on or not. If the GPS signal is weak, then the signal could be blocked due to a number of factors including the current position of your vehicle relative to tall buildings, hills or dense trees. It could also be due to environmental conditions. In each case, and especially if the vehicle is moving around, the unit should eventually be able to reacquire the signal and start updating its correct location. Please note, if the signal is lost due to environmental conditions and the vehicle has parked. Once the conditions improve, the unit will get its correct location but won’t update its position until the ignition is switched on again. If the vehicle is moving but the last seen time is relatively old, This could be due to poor network reception in the area. The unit will store its location and once the reception has improved will start transmitting its locations again. Failing the above, then it may be worth checking the wiring as the unit may not be getting power or seeing that the ignition is being switched on or off.